Ground Penetrating Radar Systems was recently called to a project by a local healthcare company in Columbus, Ohio. The scope of work was to scan a section of grass near an existing generator mapping out and locating an underground storage tank and other utilities before digging to put in a new fence. This was part of a grease trap that went to the kitchen just inside the building. GPRS, LLC. was able to get to the job in a timely matter to map out the existing storage tank. 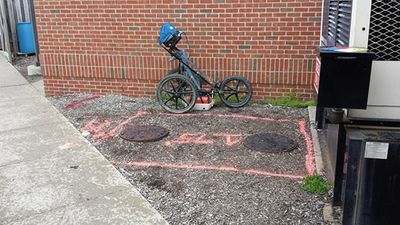 GPR is an accurate and effective way of locating underground utility lines, underground storage tanks, and voids.